Meet Pax, My Poopin' Pup toy! It's so much fun to take care of him like a real puppy. Push forward on his leash to take him for a walk. He can make happy puppy sounds when he's fed one of his treats – then sit him down to do his business. Pull back on the leash to sit him down and have him "go", like a real puppy! Pax, My Poopin' Pup toy is a hungry little guy. Feed him his treats one at a time, then take him for a walk. Uh-oh, he's gotta go! Pull back on the leash and he'll sit… then release the leash and see what he's left behind. Pick it up with the included bag. Have lots of fun with Pax, My Poopin' Pup toy. Care for him like a real puppy – he loves you with all his heart. FurReal Friends and all related characters are trademarks of Hasbro. 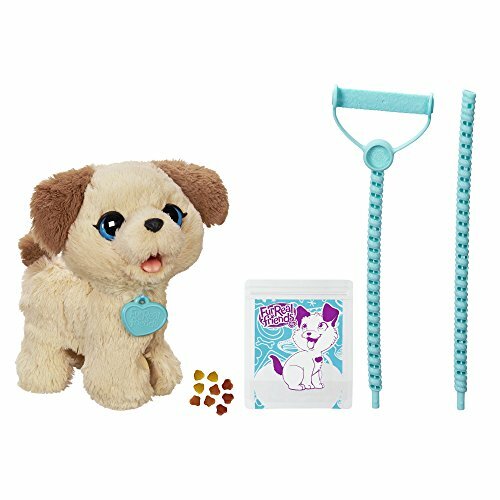 Includes pet, 2-part detachable leash, 9 treats, cleanup bag, and instructions. If you have any questions about this product by Fur Real Friends, contact us by completing and submitting the form below. If you are looking for a specif part number, please include it with your message.